There's More Than Meets The Eye With This Flashlight | OhGizmo! Flashlights are the sort of things that pretty much just sit around on a shelf or in a drawer until they are needed. This is usually inconvenient when the lights go out, but who really wants to stare at a boring old flashlight all the time? Well I think it’s time that we start making flashlights that also function as art. It seems that I’m not the first to come up with such an idea. 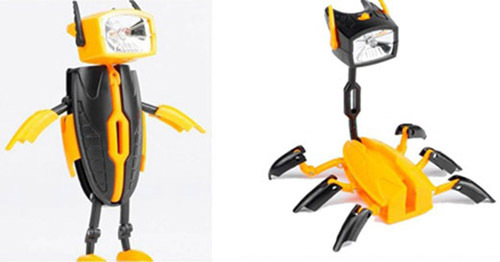 This Transformative Robot LED Torch/Nightlight almost looks like some sort of action figure or toy, but don’t let that fool you. While this might look like some sort of vicious creature, it is actually just a flashlight that’s meant to look a little different. I wouldn’t mind having one of these sitting out on my desk, honestly. You can pick one of these up for around $20 (but they’re on sale for $10 until Sunday).